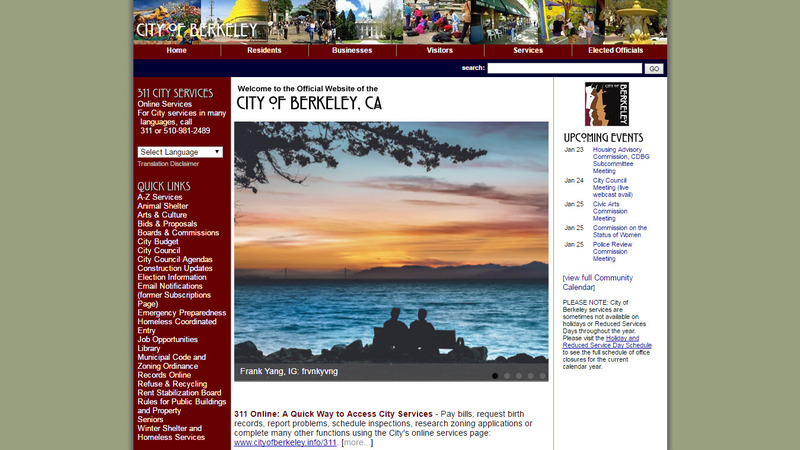 Like many government sites, the City of Berkeley site contains information about city services and functions. It aims information at residents, local businesses, visitors, and voters. The focus of the site is on helping users become informed or solve problems through reading of relevant content. There are also transactions, such as paying bills or signing up for services. The project’s aim was to create a cohesive approach to address information architecture issues and the overwhelming amount of content on the site. Findability of relevant content was a key issue. This shortcoming led to calls to city offices asking for information that was present in the site. Additionally, self-service tools were not easy to find and thus underutilized. This project didn’t focus on look and feel, as this require separate approach related to branding. In depth content analysis: Further work is necessary to understand the menu items that go together; a content inventory would gather all the function and content associated with it. Stakeholder interviews: Interviews with city staff would illuminate which topics are associated with one another. Label development and testing – plain language label development and testing these with users after IA categories are firmly established. The site is comprehensive and contains a huge breadth of content. It clearly represents a valuable resource for the city and its constituencies. Serious navigation issues exist throughout the site. 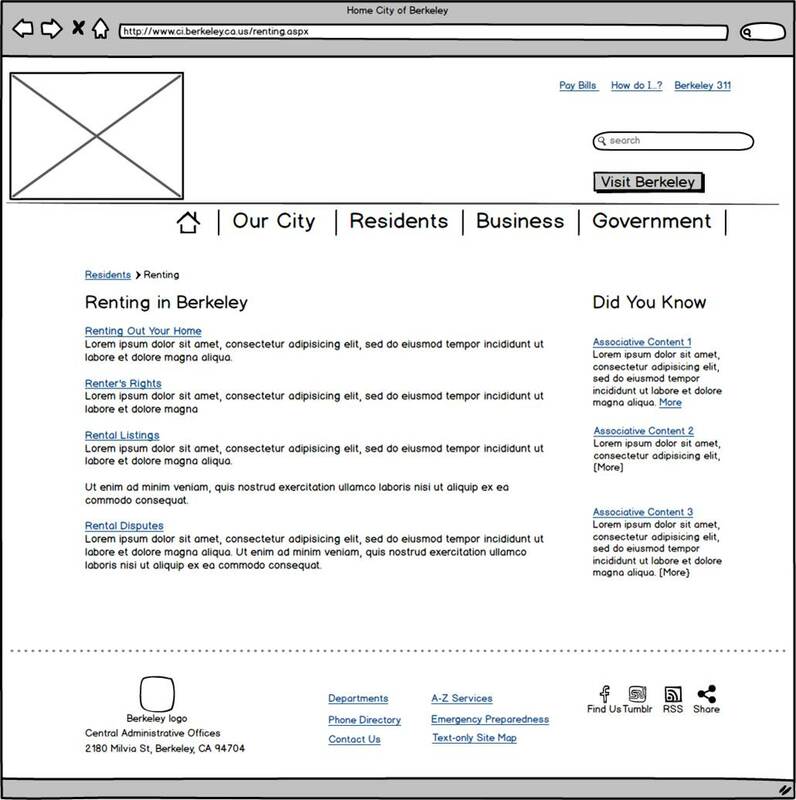 There are excessively long menus, unclear left side navigation, and lack of signaling to users where they are on the site. Label issues also exist, with many functions being not accurately described by current labels. 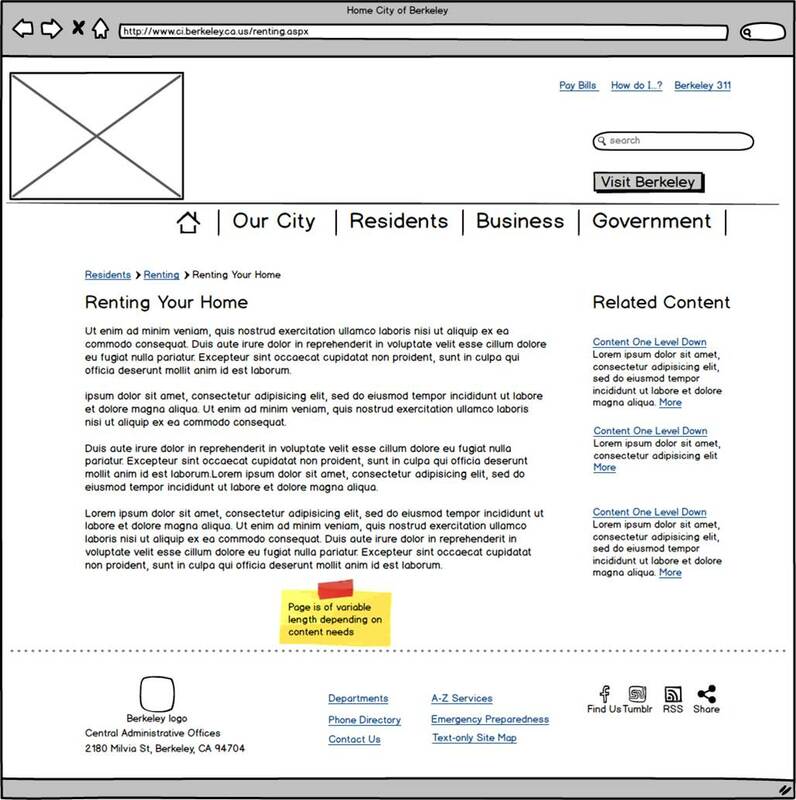 Site organization and labels are not task oriented, and rarely assist users in understanding if site has content they want, and where it may be located. Overall, this site presents many obstacles for both experienced and new users to find the content they need. Specific site challenges are detailed below. Each of the drop down menus contain more than the recommended 5 to 7 menu items. 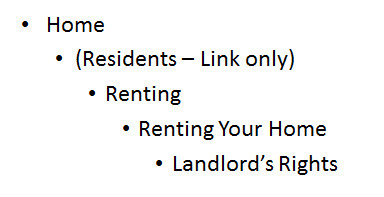 For the section entitled Residents, the drop down menu and the landing page (what you reach if you click “residents”) provide the exact same set of links. The green boxes outline the same menu items present in two different locations. Effect: Added confusion to navigation. Due to large number of links, it’s hard for the user to understand that this landing page is redundant with the top level navigation. This page add no value, but does add confusion. The drop down menus show items that are related to the top level navigation, but these are not organized further. This is present in all the horizontal top level navigation links. Effect: This requires the user read and consider each item singly. 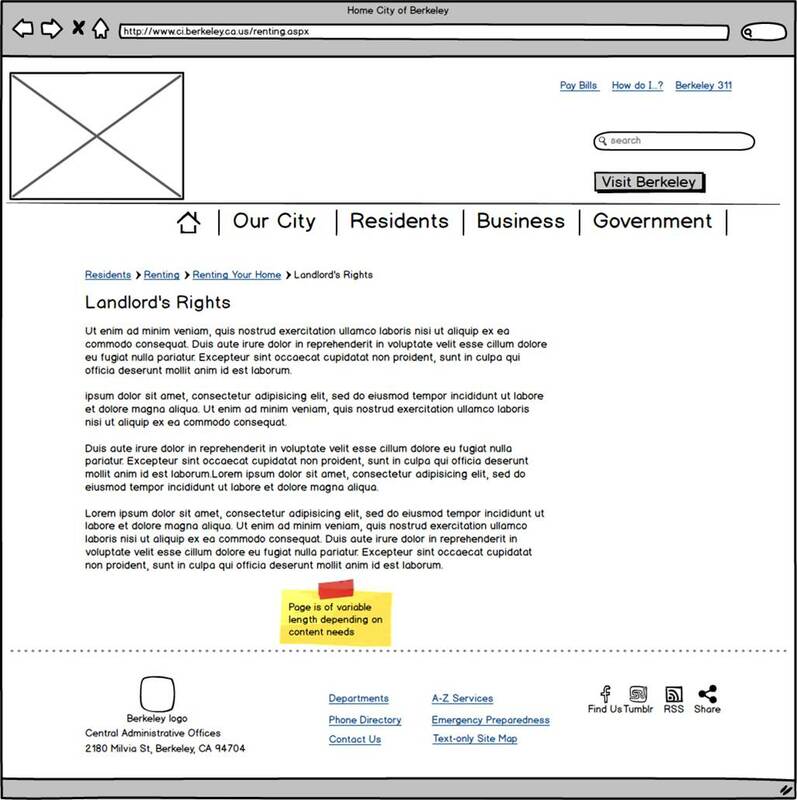 “Services” is a top level navigation, which breaks that convention of persona-based navigation established by “Residents”, “Visitors,” and “Businesses”. “Services” label is unclear: not a good descriptive category in that everything that a city provides can be construed as a service. Effect: Valuable items are ignored within “Services”. Benefits: improve overall clarity of navigation. Department names appear in large letters unexpectedly. 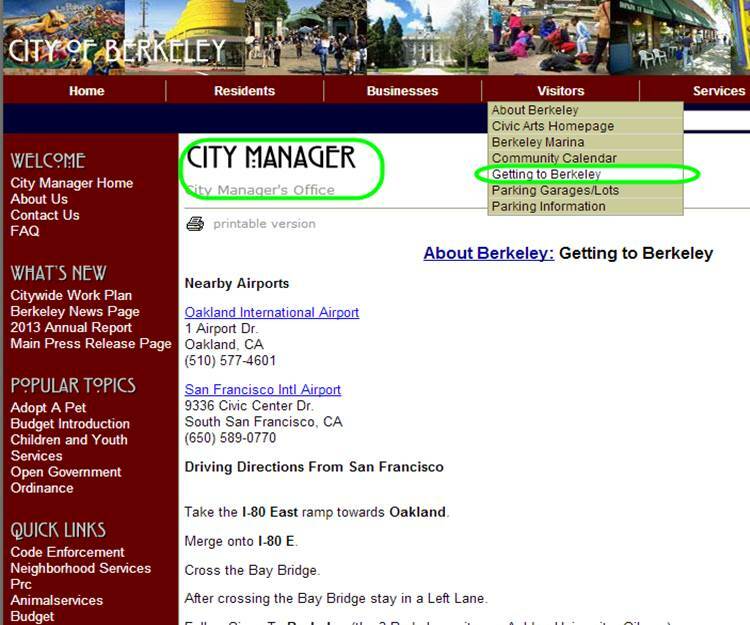 In example at below, link clicked was Getting to Berkeley, and page appears to be about the City Manager at first glance. 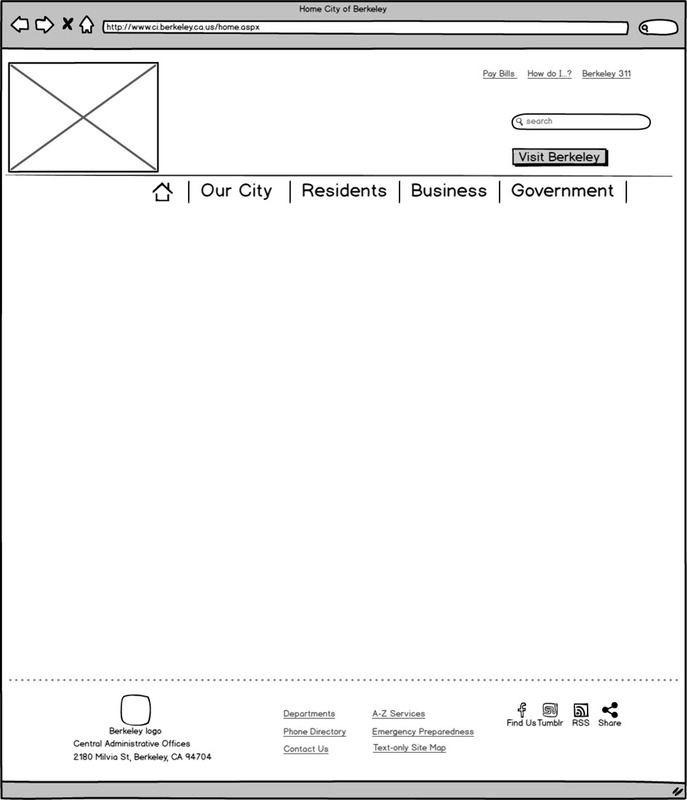 This is because the City Manager is in charge of this page and the functions noted within it. This approach is not used consistently, which makes it even more difficult to understand it. Once the menu closes, there is no visual indicator of where on the site one is. Effect: This organization-focused approach challenges the user to understand where they have arrived after clicking a link. Create clear visual signal of where user is in the navigation, such as breadcrumbs. Deemphasize the author or owner of the content; a smaller label that explains ownership has value so that user knows where to get further help. However, this should be secondary to the content. The left side contains a menu that changes with where you are in the site. The user will easily miss that this menu has changed. This is because this area is typically associated with persistent navigation that doesn’t change. Further, the headings don’t change (Popular Topics, Quick Links), while the items under it do. This makes it nearly impossible to notice the changing menu. Effect: This approach doesn’t signal to users that items on left side nav have changed and further erodes the user’s ability to navigate. Move changeable, associated links to a different location, such as right side. Create titles that give clues to relationship between links and the main body. For example, “You may also like” or “also of interest”. Effect: this makes the already full page appear even messier. It’s harder to understand what is clickable. Navigation issue 6 – Unclear signaling of location. The link clicked was Getting to Berkeley, and page appears to be about the City Manager at first glance. 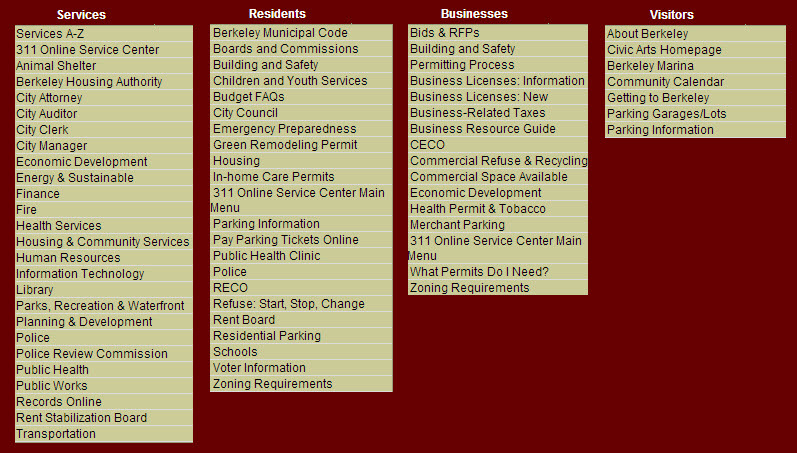 “Elected Officials” tab is reorganized and renamed to contain all “Government” services. This category now contains city service offices as well as information on elected officials. This city-centric view of services is sometimes useful and necessary for residents and businesses. There is value in seeking to orient users. This navigation page is one level lower and has an area used for associated content where similar content may be found. For example: “Renting your home” is the main topic, but related content deeper in the navigation may discovered via Related Content on right. The focus on this page is reading of content with minimal distractions. This is an “end of the line” article where associative content is not necessary. In this example, the “destination” content is three levels down. In other parts of the site require consumption pages at a higher level of navigation. 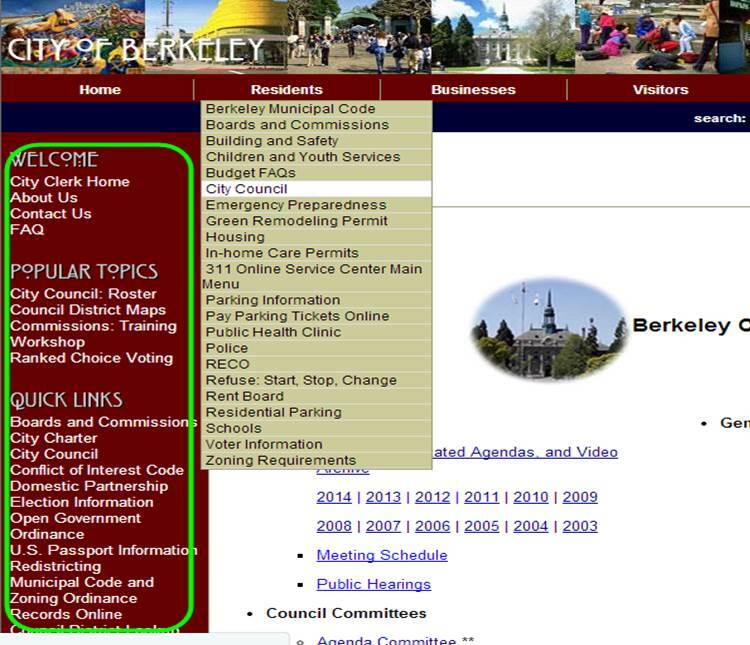 There are extensive issues with City of Berkeley website. These are a combination of problems in information architecture, navigation and labeling. As a content-rich site, successful web pages should be simple and uncluttered to allow the content to shine through and keep users focused on reading the content. 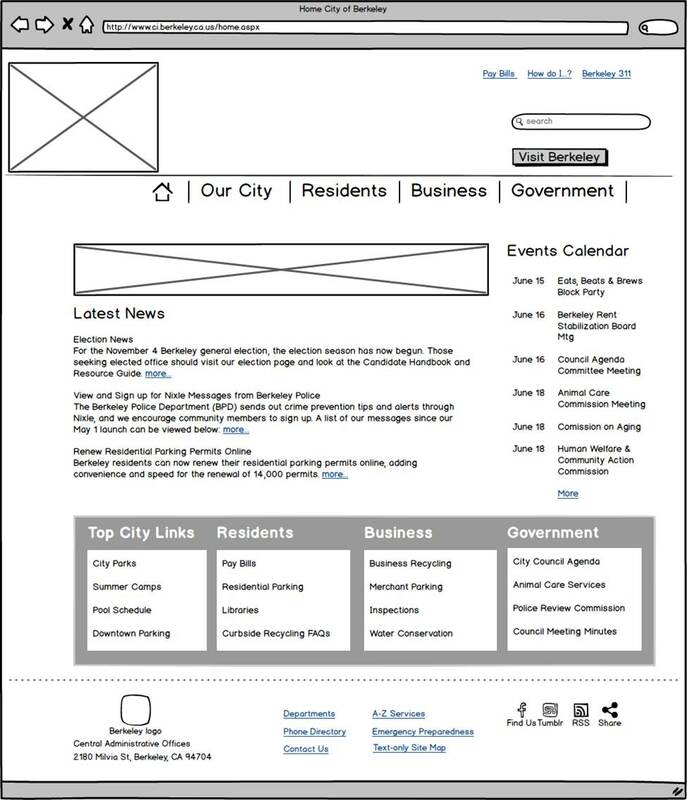 Proposed redesign relies on robust information architecture first, and simple, uncluttered design second. Further work to validate information architecture with users is necessary for greater confidence in the categories and organization. This is an extensive project, requiring a complete overhaul. 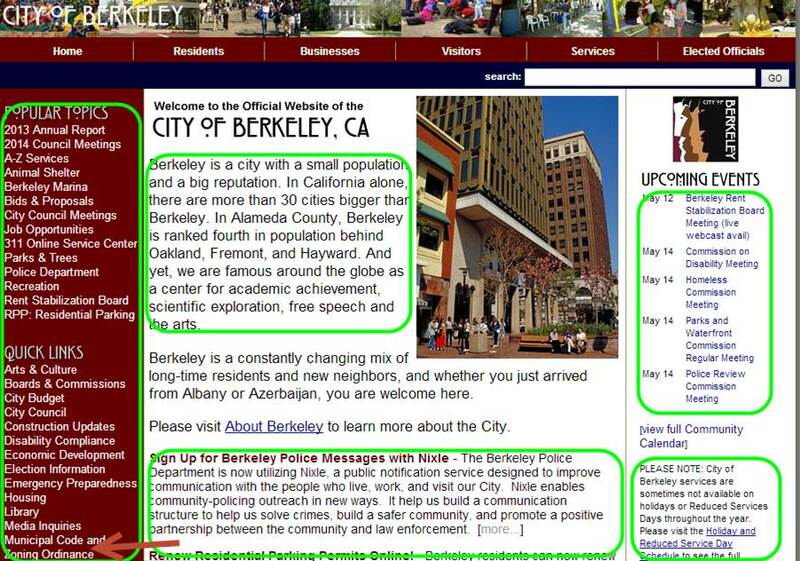 However, a more usable site experience is within reach for the City of Berkeley. Neighboring cities have already invested in restructuring their sites. A successful site will yield a return on investment characterized by an increased use of self-service and less reliance on higher cost channels.